“Mr. 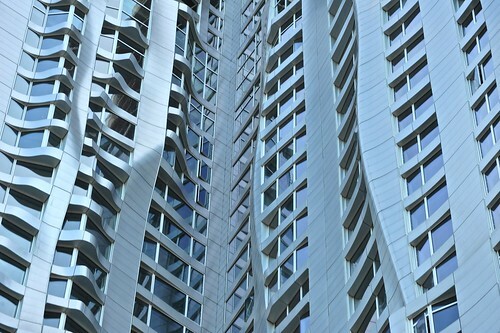 Gehry’s design is about bringing that same sensibility — the focus on refined textures, the cultivation of a sense that something has been shaped by a human hand — to the digital age. The building’s exterior is made up of 10,500 individual steel panels, almost all of them different shapes, so that as you move around it, its shape is constantly changing. And by using the same kind of computer modeling that he used for his Guggenheim Museum in Bilbao, Spain, more than a decade ago, he was able to achieve this quality at a close to negligible increase in cost.